We are reputed manufacturers and exporters of a wide range of Designer Towels. 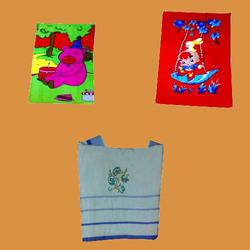 This towel comes in varied styles and sizes and manufactured as per international quality norms. We have carved our niche in both domestic and international market for our reliable range. 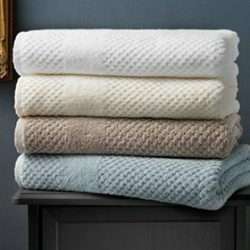 The various type of towels offered by us include Lain Terry Bath Towels, Jacquard Terry Bath Towels, Jacquard Face Towels, Jacquard Logo Woven Terry Towels, Jacquard Hand Towels, Striped Cotton Towels, Beach Terry Towels, Printed Towels, Baby Towels, Hospital Terry Towels, Logo Woven Terry Towels, Promotional Towels. We are reputed manufacturer and supplier of a wide range of yarn dyed Towels. Very soft in texture and lab tested these towels come in sizes 40x60 70x140 and 75x150. Our products are already sold by few of reputed stores. These come in various patterns and also in attractive colors. The range is widely demanded by our clientele for its durability and other quality features. We hold our expertise in dealing with a comprehensive assortment of Kids Towels. These are widely exported to a large number of customers to different countries. Our range is tailor-made in various designs and shapes which meet the latest trends of market. Our range is available at market affordable prices to our clients. 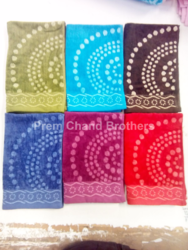 Prem Chand Brothers(Nipun) are Leading manufacturer, Supplier and exporter of a customised wide range of Printed Towel. 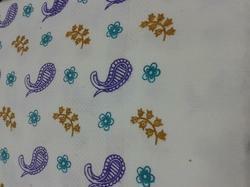 Printed Towel offered is made available in high quality 100% cotton construction finish. Dark Check Reversible Towel offered can be made available in a wide selection of choices to pick from. 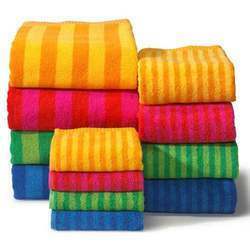 We are leading manufacturer of wide range of Striped Cotton Towels. We offer an attractive range of Promotional Towel that are manufactured as per innovative designs and styles. These are offered in different sizes which are embroidered with beautiful logo design. The logo is specifically marked to add aesthetic value of towels and it provides fascinating appeal. We offer these towels at market competitive prices and also in a customized option to our wide customers.